At 100% Design you can browse the new products and services of interior designers, home furnishings, home and hearth, kitchen and bath design, window coverings, flooring, bathroom and kitchen products, backyard landscape designers and so much more – all in one place! Three presentations throughout the weekend are scheduled: Saturday at 1pm is Eric Breuer, of Eric Breuer Designs, to discuss “Construction & Design Technology”, Saturday at 2:30 will be Michelle Denning, owner of Gold Rust and Dust, speaking on “Environmental Benefits of Re-Use in Home Décor.” Sunday at 1:30 pm we’ll have LeeAnn Brook, of LeeAnn Brook Fine Art, speaking about “Collecting Art You Love”. Admission to 100% Design is $10, and includes a free beverage from the no-host bar as well as an entry into a drawing for some fantastic door prizes. Children are free with an adult. A portion of the proceeds from this event will benefit The Food Bank of Nevada County. 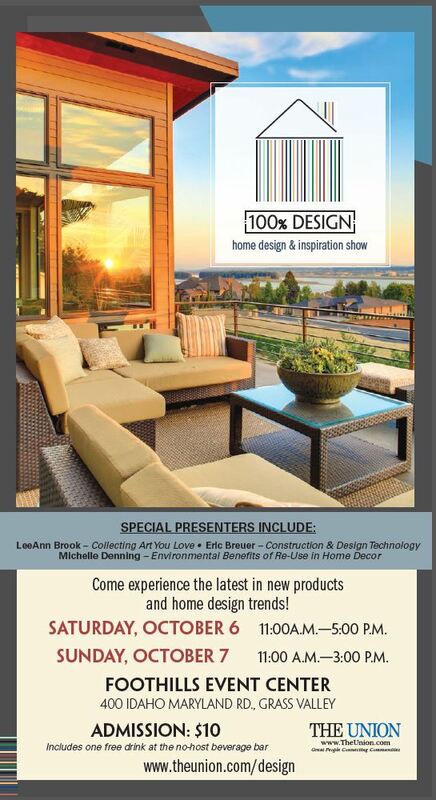 100% Design – Home Design & Inspiration Show runs from 11:00 a.m. to 5:00 p.m. Saturday, October 6, and 11:00 am to 3:00 pm Sunday, October 7 at the Foothills Event Center, 400 Idaho Maryland Road, Grass Valley, California. For more information or to purchase tickets online, visit www.theunion.com/design or call 530-477-4241.